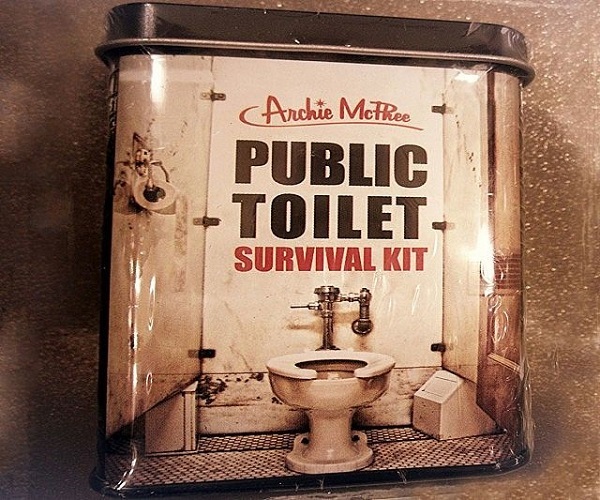 This Public Toilet Survival Kit makes a great gag gift for those who hate or fear using public restrooms at truck stops, gas stations, shopping malls, or fast food restaurants. Each survival kit comes with one toilet seat cover, two anti-septic wipes, and one pair of disposable latex-free gloves. The contents of the kit come stored in a 3.75 inch tall tin. Regardless of whatever sanitary issues you may run into, make sure you're prepared with the public toilet survival kit. Keep yourself safe and hygienic while traveling in even the most challenging conditions. You never know when you're going to encounter a cleanliness issue, so make sure you're prepared with a public toilet survival kit at all times. You'll thank us later. Each survival kit for public restrooms measures 3.8 inches by 2 inches by 1 inch and weighs 1.6 ounces.